Merchandise is one of the largest – if not the largest – money-making sources bands have today, when done correctly. While it’s important to set up a merch booth at all of your shows, there are a variety of websites out there that are providing bands with a way to sell their merch on a much larger scale. We researched the best available options for indie bands so that you don't have to. Here are our two favorite websites that take merch selling to the next level. 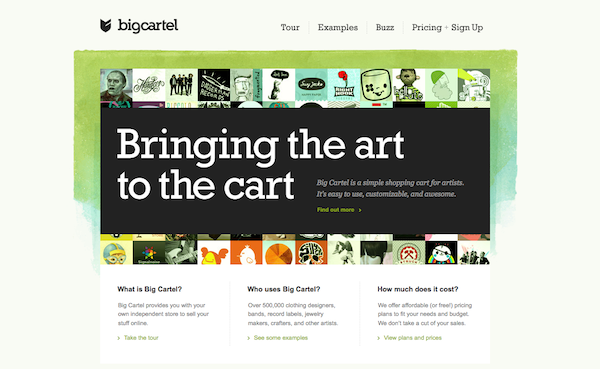 Big Cartel is a simple e-commerce solution specially designed for musicians, artists, and crafters. 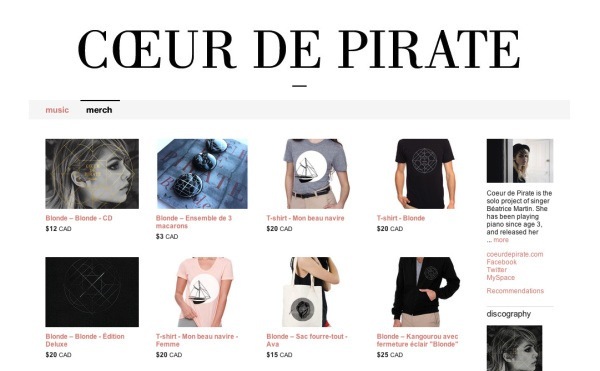 With an easy-to-use website, setting up shop for your band merch is streamlined and accessible. Rather than taking a percentage of each sale, Big Cartel uses a monthly membership system (see pricing below). There's no commitment, and you have the ability to cancel anytime, should you choose to do so. Something that really stands out to us about Big Cartel is that they're dedicated to remaining small and focusing on artists rather than larger scale businesses. The interface is very user-friendly, which is helpful for those without previous e-commerce site experience. Shipping is done through PayPal, which means there is no way to customize shipping options beyond what PayPal offers. If you’re looking for guaranteed fast shipping or specific services, this may not be the best site for you. Gold: $0 per month, 1 image per product, basic stats (most viewed product list), basic customization (change colors, fonts, graphics, or CSS but no access to store’s HTML), no discount code functionality, must use bigcartel.com URL. Platinum: $9.99 per month, 25 products, 3 images per product, better stats (most viewed products, number of people visiting store, ability to use third party analytics including integrated Google Analytics), full customization (including access to HTML), inventory tracking, discount codes, custom URL option. Diamond: $19.99 per month, 100 products, 5 images per product, best stats (most viewed products, number of people visiting store, websites linking to your store, search terms used to get to your store, ability to use third party analytics including integrated Google Analytics), full customization (including access to HTML), inventory tracking, discount codes, custom URL option. Titanium: $29.99 per month, 300 products, 5 images per product, best stats (most viewed products, number of people visiting store, websites linking to your store, search terms used to get to your store, ability to use third party analytics including integrated Google Analytics), full customization (including access to HTML), inventory tracking, discount codes, custom URL option. Big Cartel offers many different options for selling merch that would likely fit what most bands need. Their easy interface and well-known presence online make it a good option. Since they're focused more on smaller businesses and creatives, their mission is more in sync with what many bands and artists would be looking for. Along with hosting music, Bandcamp offers its users the option to sell merchandise. From electronic to physical, you can set up your shop by following their easy-to-use tutorials. Merch stores are synced with band pages for convenient access. Sell whatever you’d like, whether it be T-shirts, CDs, stickers, or buttons. You control the price of the items and have the option to let fans pay what they’d like, which often leads to more money than you’d be charging in the first place. Bandcamp takes a percentage of sales rather than a monthly payment, so if you don’t sell, you don’t owe any money and it’s still free to keep merchandise listed! As mentioned above, Bandcamp takes a percentage. 10-15% of each sale will be deducted from the total cost, which can be an issue for some if the product price is low to begin with. No monthly payment. Bandcamp takes 15% on digital and 10% on physical merch sales. Due to Bandcamp's popularity among emerging artists, using their online merch store is a great option. The price is respectable, and their easy-to-use features make it a stress-free option. What other stores are you using to sell your merch? Let us know in the comments below!